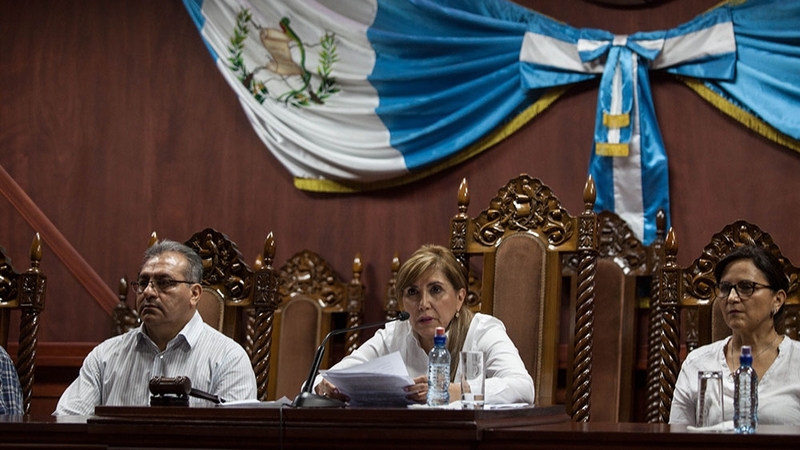 Guatemala City – Guatemalan activists and politicians warn of a breakdown in constitutional order following the government’s rejection of a court ruling overturning the president’s decision to ban an international anti-corruption commissioner from the country. Late on Sunday, the Constitutional Court voted to overturn a governmental measure, issued earlier this month, that barred Ivan Velasquez, the head of the UN-backed International Commission Against Impunity (known by its Spanish initials, CICIG), from the country. Following the ruling, high-level officials told reporters that the government will not accept Velasquez as the CICIG commissioner and will send the UN a request for a list of suggested replacements. The developments prompted a fierce response from rights groups and others, including Iduvina Hernandez, director of the Association for the Study and Promotion of Security in Democracy, who say the government’s handling of the order is a “litmus test for [the president] and for institutionality”. Leocadio Juracan, an opposition politician from the Convergencia party, initially celebrated Sunday’s court ruling, but said he was concerned about a constitutional breakdown related to the government’s response. “If there is not compliance with [the ruling], is a clear demonstration of contempt of the law,” he told Al Jazeera. According to Juracan, people in power have used their power to blanket themselves with impunity and that is what is happening now in Guatemala. “Every day now the real dispute for power that is happening in this context in the country is becoming more evident, and that is where the population should continue with their pressure, demanding justice, because historically in Guatemala the population has never been heard,” he said. CICIG has played a key role in combating government corruption in Guatemala, working alongside Guatemalan prosecutors to bring cases against high-level officials, judges, and corporate executives. Prosecution of corruption has soared during the five-years Velasquez, a Colombian former judge, has been CICIG commissioner. In 2015, then-President Otto Perez Molina was forced to resign and was promptly arrested after a corruption investigation. He and much of his administration are currently in jail awaiting trial on corruption charges. 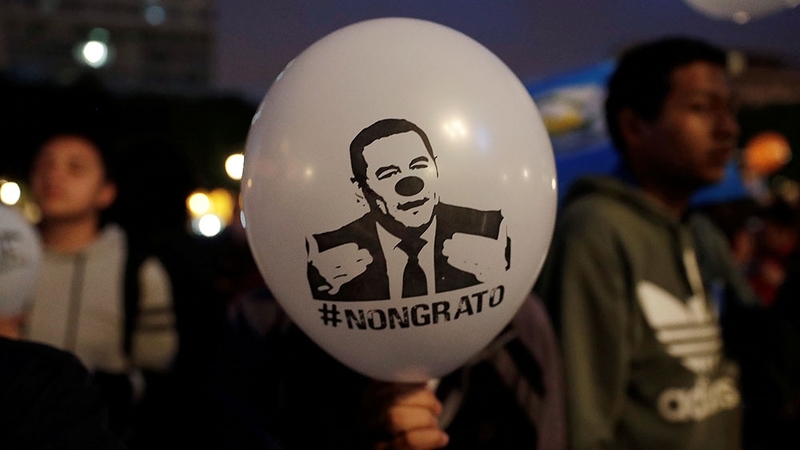 Elected in late 2015, current Guatemalan President Jimmy Morales ran on an anti-corruption platform and promised to support CICIG. That support appeared to falter after Morales and his party became the subjects of investigations into illegal campaign financing. Morales declared Velasquez persona non grata in 2017, but a Constitutional Court ruling overturned the measure. Although Morales abided by the ruling at the time, he announced late last month that he would not renew CICIG’s mandate, which is set to end in September 2019, and again barred Velasquez’s entrance to the country, setting off a number of legal changes and protests. On Sunday, the court ruled that Velasquez be allowed back into the country, saying that the moment he is denied entrance, there will be legal consequences. The ruling was celebrated by those who gathered outside the courtroom following the decision. “It’s fantastic that the ruling announced tonight was the result of the unanimity of the court,” Hernandez told Al Jazeera outside the court on Sunday night. That optimism soon turned into concern, however, after high-level officials announced on Monday they were not obligated to permit Velasquez back into the country, arguing the ruling does not mention Velasquez by name. “Nowhere in the ruling does it establish that the president must permit Mr Ivan Velasquez into the country,” Inspector General Jorge Luis Donado said at the press conference Monday. Donado added that the government could not comment on the intentions of the court magistrates or their comments beyond the text of the ruling. Before the officials’ announcement, presidential spokesman Alfredo Brito told Al Jazeera that a legal team was analysing the court decision and that an official position would follow. Although the Sunday’s ruling only mentions “the commissioner”, Constitutional Court magistrates made it clear they were referring to Velasquez in their remarks during the press conference Sunday evening. “Many are asking why we said ‘commissioner’ instead of saying ‘Ivan Velasquez’. And the truth is that we are using as our foundation Article 12 of the [CICIG] agreement which refers directly to a commitment by the Guatemalan state with the United Nations,” Constitutional Court magistrate Gloria Porras told Guatemalan news programme, ConCriterio. “The commissioner designated by the United Nations must have access to the country without any kind of restrictions,” she added. Hernandez said now is the time for the public prosecutor to act. “The government – the president and the ministries of the interior and foreign affairs – has consummated the disobedience of the Constitutional Court ruling,” she said following the officials’ announcement. The office of the public prosecutor issued a statement on Monday with a message from Attorney General Maria Consuelo Porras, who urged all parties to respect the ruling. “She ratifies her firm position to act in the face of any situation that gives rise to the commission of a crime,” said the statement, adding that all public prosecutors and personnel are instructed to do the same. Concerns over the militarisation of the country also remain. When Morales announced he would not renew CICIG’s mandate, he was flanked by dozens of military and police officials. A significant police presence and some military-style special forces were on the streets last week in advance of protests outside Congress and the national palace. “It’s generating terror for the population,” said Marcelo Sabuc, the national coordinator of the Campesino Committee of the Highlands. “It’s as though things are sliding back to the times of the conflict,” he told Al Jazeera. A 36-year armed conflict, which ended in 1996, between leftist rebel groups and state and paramilitary armed forces devastated Guatemala. Indigenous Mayan civilians bore the brunt of the violence, which left an estimated 200,000 people dead. State forces carried out acts of genocide in four regions of the country, according to a UN-backed truth commission. Authoritarian governments and military rule in the decades prior to the 1996 Peace Accords are still fresh on many Guatemalans’ minds. As recently as 1993, then-President Jorge Serrano Elias attempted to dissolve congress, the Supreme Court, and other institutions. “We don’t want to live through another coup d’etat,” said Sabuc. Protests against the government are expected to continue this week, with calls for Morales to step down. “The population is positing that this is not a problem between Jimmy [Morales] and Mr Velasquez. It is a problem of institutionality and the rule of law, which the population at large proposes to defend,” said Hernandez.